Disabled Americans came in wheelchairs into the United States Senate to register their protest against the harsh Republican plan to slash health care. ADAPT, a disability rights group, staged a die-in right before the office of the leading Republican in the Senate, Mitch McConnell of Kentucky. About 60 protesters tried to block the entrance to McConnell’s office. Their goal was to show the rest of America what would come out of the American Health Care Act (AHCA), which the Republicans sought to push through as an alternative to Obamacare. 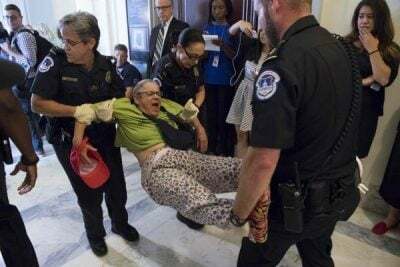 The police arrested 43 protesters and wheeled out others from McConnell’s hallway. The McConnell plan would slash Medicare, a government plan that provides health-care coverage for low-income Americans and for those with disabilities. One of the elements of the plan envisages cutting funds for in-home assistance that allows disabled Americans to remain in their own homes rather than move to nursing homes. Fourteen million Americans will lose any access to health insurance. Harshness towards the vulnerable defines Trump’s agenda. There was a whisper of this when Trump mocked a disabled reporter for The New York Times, Serge Kovaleski, and when 12-year-old J.J. Holmes, who has cerebral palsy, was ejected from a Trump rally in Tampa, Florida. The disregard shown to people with disabilities reveals the kind of agenda that Trump was always going to drive. Generosity towards people is not his metier. His is a harsh project, to push aside the vulnerable in a social Darwinist drive to excellence. Weakness is reviled. Strength is applauded. 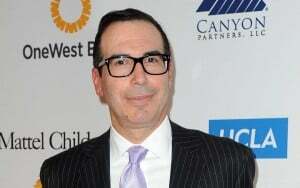 In late June, Trump’s Treasury Secretary Steven Mnuchin married the Scottish actress Louise Linton. They had a lavish wedding, attended by Trump, his Vice President and most of the Cabinet. Mnuchin and Louise Linton live in a $12.6 million home in an exclusive part of Washington, D.C. The money is Mnuchin’s, what he made as a partner in Goldman Sachs. Mnuchin is not the only fabulously wealthy person in Trump’s cabinet. He sits at Cabinet meetings near Commerce Secretary Wilbur Ross and Deputy Commerce Secretary Todd Ricketts. Trump’s Chief Economic Adviser is Gary Cohn, another former Goldman Sachs president. All are worth hundreds of millions of dollars each. At a rally in Cedar Rapids, Iowa, just after the Mnuchin wedding, Trump mused about the wealth in his Cabinet. “Somebody said—why did you appoint a rich person to be in charge of the economy? No, it’s true. And Wilbur’s a very rich person in charge of commerce. I said—Because that’s the kind of thinking we want’.” What kind of thinking would that be? The thinking of someone who was willing to set aside any social agenda for his individual gain. Trump’s base is made of a combination of people of great wealth—who are few—and the immense white-collar middle-class sector that has found itself made vulnerable by globalisation. Business process outsourcing struck the white-collar middle class, which formed the base of the Tea Party and then the Trump movement. He promised this base that he would not become wedded to Wall Street but would put Main Street in charge. That has not come to pass. No poor or middle-class person should direct commercial or budgetary policy. That should be left to the rich. This is an honest assessment of Trump’s project—to appeal to the mass of white-collar vulnerable workers, but to deliver the reins of power to the very wealthy. In a new book, Duke University professor Nancy MacLean goes into the intellectual roots of the radical Right and the vision of the current agenda, as articulated by Trump. The Right, she shows in Democracy in Chains: The Deep History of The Radical Right’s Stealth Plan for America, is interested in the destruction of “society” and the creation of pure individualism. Charles Koch, one of the major financiers of the radical Right, relied upon Baldy Harper. Harper argued, decades ago, that support for vulnerable populations would erode liberty. He suggested that liberal policies that helped the poor and the disadvantaged would be like a disease against society. These are harsh words. The idea of a “bitter curative medicine” is something that is natural to the Trump team. The vicious knives they wield against any social policy for the poor and the vulnerable are sharp and are used with gusto. One can see the way they cut away at precious social policies in the budget and in their health care plans. “are to be treated as subordinate members of the species, akin to animals who are dependent”. The language here is ferocious. It is mimicked by Trump and his Cabinet. Let us return to Trump’s budget. He proposes to cut $2.5 trillion in programmes for the working class and the indigent. Food stamps, the essential means for the poorest Americans to access food, would go. It is important to underline that one in six Americans struggles with hunger—49 million Americans have a hard time putting food on their tables. One in five children is at risk of hunger, with the ratio higher—one in three—for African-American and Latino families. There will be no easy way for Americans who struggle with food insecurity to feed themselves. They will be left to starve, like “subordinate members of the species”. Aid to the poor, says the Trump team, does not work. The poor must be made to “go to work”, said Trump’s Budget Director Mick Mulvaney. But how to go to work when jobs are simply unavailable, as Trump himself has said on many occasions? In fact, the office that helps the poor find jobs has also been slated to be cut. That means even those few programmes to assist the unemployed to find work will no longer be available. In fact, as New York University Professor Jonathan Morduch and Rachael Schneider say in their new book The Financial Diaries, even those who have jobs at low pay struggle to make ends meet. Many of them rely on government assistance to get by. If they do not get access to government programmes, they turn to credit card loans and payday loans to cover their bills. There is great fragility in the budgets of the working poor. There is cruelty in Trump’s vision. It throws the poor to the lions of desperation. The remnants of liberalism are being withdrawn. This is the end of the social contract.